When the stars make you drool, just like pasta fazool, that's amore! 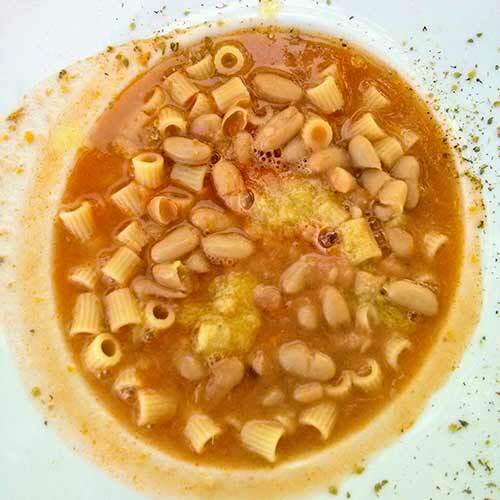 Pasta e fagioli is pasta and beans, a very simple cucina povera variant that makes an excellent and healthy pasta dish. At one time it was a soup thickened by taking a small portion of the pasta, beans and liquid and smashing it into a paste which was added back into the dish. Grated cheese can be added, as you can see in the picture above, where a small dusting of dried herbs has also been added to the dish. Short pasta like ditalini is used with beans, typically borlotti or cannellini. Sometimes ceci, chick peas are used. The traditional recipe doesn’t include tomato, but modern cooks throw a lot of things into this dish, including ground beef (!). Even in a trusted “authentic” restaurant pancetta might appear in the sofrito, so vegetarians might want to ask. I like the traditional, unadorned dish. It’s Italian. Less is more.